It was a day of celebration for the Union health ministry. On February 25, it received a message from WHO saying India’s name has been taken off the list of polio endemic countries as not a single new case of wild polio was reported in the past one year. A two-year-old girl from Howrah in West Bengal on January 13 was the last detected case of wild polio. This is a milestone but the battle against the crippling disease is not over yet. By ministry’s own admission, seven children developed polio from vaccine-derived poliovirus (VDPV) last year alone. The infection is caused by poliovirus excreted by immunised children. Besides, public health experts estimate, each year between 100 and 200 children get paralysed due to a side-effect of the vaccine, called vaccine-associated polio paralysis (VAPP), in which the vaccine infects the child instead of protecting him. As of now the government has no plans but to continue the oral polio vaccine. Sources say, as per WHO’s recommendation, India might switch to an advanced oral vaccine by 2013. Even that might not contain polio. “The problem with oral polio vaccine is it contains live, though weakened, poliovirus,” says T Jacob John, former head of the department of clinical virology, Christian Medical College in Vellore. The virus multiplies in the gut of children, spreads through the bloodstream and produces antibodies against polio. But at times it regains its virulence and causes VDPV or VAPP, he adds. Thus there is an urgent need to switch to injectible polio vaccine, which contains inactivated or dead poliovirus that does not lead to infections, says John. As former member of the National Technical Advisory Group for Immunisation, John has studied the efficacy of polio vaccines since oral polio vaccine was launched as part of the public health programme. Another advisory group for polio eradication, The India Expert Advisory Group, last year recommended the government to consider switching from oral polio vaccine to injectible vaccine. At least 72 countries, including the US, Canada and most European countries, have already shifted to injectible polio vaccine after they reached the point where India now finds itself. For instance, after the US eradicated wild polio, the only polio cases that were reported from there were those caused by oral vaccine. This made the country switch to injectible vaccines. The government is confident it can eradicate polio through oral vaccines. “The vaccine causes the disease in one in a million cases,” says Ajay Khera, deputy commissioner (immunisation) of the health ministry. “Why should we introduce expensive injectible vaccine? Administering one dose of injectible vaccine per child would cost Rs 100 compared to Rs 5 in case of oral vaccine,” he says. Oral vaccine is also easier to administer, says Ajay Gambhir, joint secretary of the Indian Medical Association. For giving injections trained staff is needed. Disposal of injections would be a problem. Experience shows if a vaccine is injectible, the coverage is not more than 60 per cent, he adds. The health ministry claims the coverage of oral polio vaccine in the country is over 90 per cent. The strategy with oral vaccine is to immunise as many children as possible, believes the government. Khera says many countries have eradicated polio by oral vaccine. 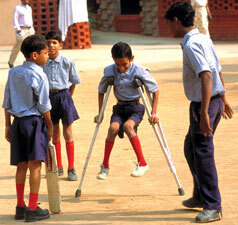 Sri Lanka, for instance, has been polio free for the past 19 years. But how does one explain the 2010 epidemic in China, which had eradicated polio by using oral vaccine and remained polio-free for over a decade. Oral polio vaccine developes 30 per cent immunity against polio in India, whereas two doses of injectible polio vaccine developes 100 per cent immunity, says John. “Complete polio eradication requires injectible polio vaccine,” he says, adding children will continue to suffer from vaccine-linked polio if the national policy does not change. Agrees Vipin Vasistha, paediatrician in Bijnor, Uttar Pradesh, and national convenor of the Indian Academy of Paediatrics (IAP) committee on immunisation. The strategy is to slowly phase out oral vaccines and replace them with injectible polio vaccines, he says. Until the national policy changes, IAP recommends two doses of injectable vaccine with three doses of oral vaccine.